Bioactive glasses have been developed for medical applications in the body for bone and tissue repair and regeneration. We have developed a borate-containing bioactive glass (13-93B3, referred to as B3), which is undergoing clinical trials to assess its wound-healing properties. To complement the healing properties of B3, metal ion dopants have been added to enhance its antimicrobial properties. 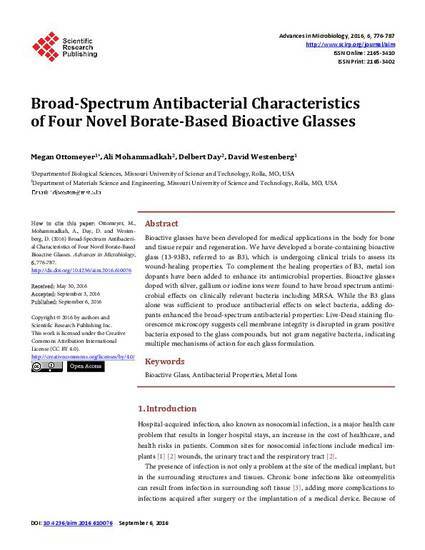 Bioactive glasses doped with silver, gallium or iodine ions were found to have broad spectrum antimicrobial effects on clinically relevant bacteria including MRSA. While the B3 glass alone was sufficient to produce antibacterial effects on select bacteria, adding dopants enhanced the broad-spectrum antibacterial properties: Live-Dead staining fluorescence microscopy suggests cell membrane integrity is disrupted in gram positive bacteria exposed to the glass compounds, but not gram negative bacteria, indicating multiple mechanisms of action for each glass formulation. © 2016 Scientific Research, All rights reserved.